Buying Airline Tickets: Which Credit Card Should You Use? When it comes to buying airline tickets with a credit card and earning extra bonus miles or points while you’re at it you have a lot of choices. If your wallet is full of rewards cards, you may wonder which one will best leverage the money you spend on plane tickets each year. First Things First: Did You Just Apply for a New Credit Card? Before we even begin talking about specific credit cards and the rewards they offer, we have to ask one question: Are you currently working to fulfill a minimum spend requirement to receive a sign-up bonus for a new credit card? If so, do you have a plan to complete that requirement? If you’re worried you wont quite hit the minimum with your current rate of spending, you should charge your next airline ticket to the new card. You don’t want to take chances with that sign-up bonus. Don’t worry if you didn’t exactly maximize the miles/points-earning opportunity. You can on the next ticket purchase. Which Credit Card Offers the Best Rewards for Purchasing Airline Tickets? Now that we have that out of the way, lets talk about strategies for leveraging air ticket purchases and the best credit cards available to do that. The advice here is general, and whats best for you will depend on your circumstances such as where you live and where you fly, what cards you have, how you value the various loyalty currencies, and what your travel goals are for the next year or two. Here are the cards that we think are the most valuable when it comes to purchasing airfares. You’re almost always better off collecting flexible points like American Express Membership Rewards and Chase Ultimate Rewards that can be transferred to a variety of airline and hotel programs. That way you can use your points on a variety of different programs instead of being locked into one. Of course, there are co-branded airline and hotel cards that you might want to devote your airfare spend to depending on how you value the miles/points in those programs. To help you review the options, lets take a hypothetical situation into account. Nate and Jenny usually buy six round-trip airline tickets a year. They make four trips to visit family throughout the year, head to Hawaii each winter, and go to Europe in the summer. Their annual budget for airline tickets is $6,000. In the examples below well use them as a test case to see how many miles or points they’d earn by using a specific credit card. On Chase Sapphire Preferred: You can see that this card rewards the most for this couple. They can transfer these points on a one-to-one basis to Amtrak Guest Rewards, British Airways Avios, Korean Air Skypass, Singapore Airlines KrisFlyer, Southwest Airlines Rapid Rewards, United Airlines MileagePlus, and Virgin Atlantic Flying Club as well as Hyatt Gold Passport, IHG Rewards Club, Marriott Rewards, and Ritz-Carlton Rewards. On American Express Premier Rewards Gold: Amex PRG rivals Chase Sapphire Preferred in terms of the number of points you’ll receive in return for using the card to make airfare purchases. And points can transfer to a variety of airlines, including AeroMexico, Air Canada, Air France, Alitalia, All Nippon Airways, British Airways, Cathay Pacific Airways, Delta Airlines, El Al, Emirates, Frontier Airlines, Hawaiian Airlines, Iberia, JetBlue Airways, Singapore Airlines, Virgin America, and Virgin Atlantic Airways. Most transfer on a one-to-one basis. MRs can also be converted to Best Western, Choice Privileges, Hilton, and Starwood though the transfer ratios aren’t lucrative. On co-branded airline credit cards: There are a number of co-branded airline credit cards that you could devote your airfare spend, but its generally not wise unless you value those miles more than Chase Ultimate Rewards or American Express Membership Rewards points. You’ll need to weigh this decision on your own, but we will say this: If you’re saving for a specific award on Alaska Airlines, it might make sense to buy your Alaska Airlines flights using the co-branded card, which offers 3x miles per dollar spent. 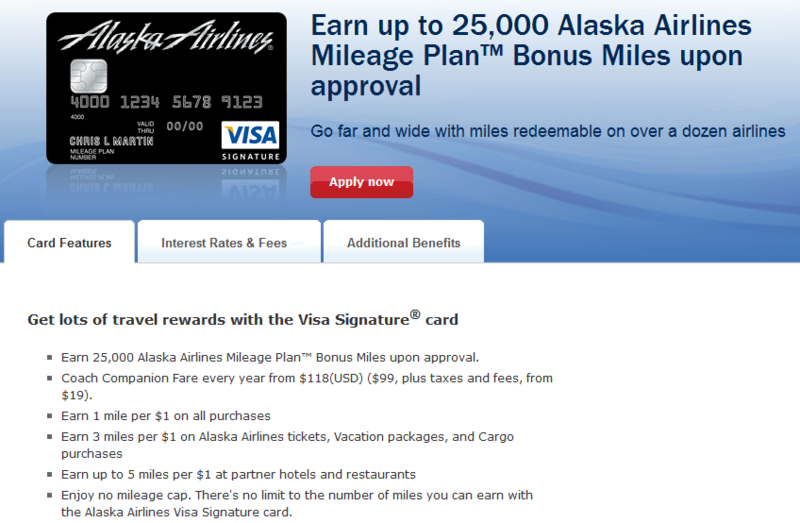 If you have to travel on any other airline and use your Alaska Airlines credit card, you’d only get one mile per dollar spent. On co-branded hotel credit cards: At first blush the Hilton HHonors credit card deal might look enticing. After all, you’d get five HHonors points per dollar spent on airfare. However, take a look at Hilton HHonors rewards chart and you’ll see that those points might not take you as far as you’d like. In Nate and Jenny’s case, they’d only receive 30,000 HHonors points in exchange for $6,000 in airline spending, which is only enough for a one-night stay in a Category 4 or 5 hotel like the DoubleTree Orlando “Lake Buena Vista in Florida.